Thank you, DAA, (Dementia Action Alliance in USA) for opportunity of investing with this organization. People i was involved with were helpful, kind, and thoughtful. Projects i was involved with were helpful, and met goals of both DAA as an organization, and myself as a person. 2017 “Re-Imagine Life with Dementia” conference, planning (including gathering PLwD artists), presenting, etc. Vid of my presentation begins at 50minutes into this recording >> https://youtu.be/nZTCAlfg_Zg . Wrote about the conference here >> https://truthfulkindness.com/2017/07/09/1st-daa-conf-usa2017/ . 2018 vid “Living Beyond Dementia” for US Neurology conference >> https://youtu.be/Hw20LNtwNGo , and attendance at that conference . Conference Planning, Arts, Well-Being, Technology, etc. But now it is time for me to do other things. USA’s Dementia Action Alliance website is here >> https://daanow.org/ . 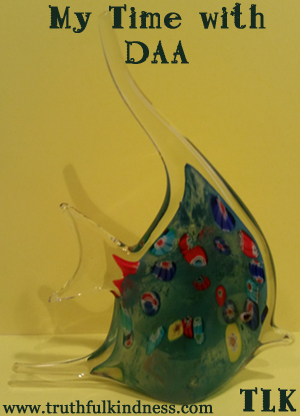 Glass fish from island of Murano was gift of Thanks from Dementia Action Alliance to me. While living in Italy i had an older friend on island of Murano; an exceptional glass artist named Tino Gobbato. i always enjoyed our conversations — and the wonderful glass creations in various stages of completion. His “Baroque Chandelier” hangs over the antique table i inherited, and right now, the Murano fish sits on that table. * Admin issues: SHARE dementia awareness thru buttons below. Feel free to leave your thoughts in the form of comments, but please filter your comments with truthful loving kindness to all concerned. If interested in receiving notice of future blog postings, subscriptions are available through a “follow” button in the upper left corner (MS Explorer) or lower right (Safari, Mozilla Firefox and Chrome). If there is an advertisement below, I have no control over what is shown. My own full legal name is Truthful Loving Kindness. My current diagnosis is still Mild Cognitive Impairment, but my neurologist said I am in a unique position for helping because I have “one foot in each door”. Text Copyright © 2018 Nov 05. Tags are: DAA, dementia, Dementia Action Alliance, PLwD, Truthful Kindness. This entry was posted in Journal and tagged DAA, dementia, Dementia Action Alliance, PLwD, Truthful Kindness. Bookmark the permalink. It is with a heavy heart that I pass on Tino Gobbato’s passing this past May 2019. His work was my first purchases in 1977 and I would visit his shop any time I was in Italy. He will truly be missed. I lived in Vicenza during early 80s. THANK you for the news, but so saddened to hear of Tino’s passing. i treasure the memories of the times we had together. His memory is a blessing.